Guests at your Chinese restaurant will enjoy reading the lucky messages wrapped inside these Panda fortune cookies! These small, crescent shaped cookies are a traditional favorite at Asian dining establishments. Each cookie contains a paper slip with a fortune for guests to read when they break open the cookie. They'll love seeing what luck has in store for them, as much as they love eating the fortune cookie itself! The sweet flavor, crispy texture, and subtle glossy look of fortune cookies make them the perfect after-dinner complement. I love snacking on these, they are a quick good treat. I've read way to many fortunes and I think they are giving me a false sense of security. Chinese food, even when consumed at home, just isn't complete without fortune cookies. I tried making these myself years ago but have purchased them ever since. I bought these to use at my daughter’s wedding. We had an Asian buffet on which we displayed the cookies in glass urns. The packaging was appealing, and the taste was really good! We even put them in our favor boxes. There were a few we had to toss because of breakage but, I had bought more than enough. They are so inexpensive! I was very happy with them! Much better value compared to Amazon. delicious and fresh!! I work in a LTC facility and my residents LOVE the fortune cookies w/ their Asian based meals!! They are a big hit and very fun at the same time as everyone compares fortunes and dreams about winning the lottery with their lucky numbers! VERY CONVENIENT FOR PARTIES, RESTAURANTS, AND EVEN FOR LATE NIGHT SNACKS. LOVED THE INDIVIDUAL WRAPPING AND LITTLE NOTES INSIDE OF EACH COOKIE. AS FRESH AS BUYING FROM CHINESE RESTAURANT. We appreciate your feedback! We’re sorry these were stale. A Customer Solutions Representative will be contacting you soon. These are definitely my favorite fortune cookies. They are delicious and crunchy and arrived on-time in safe packaging. I haven't encountered a single broken one yet! These are super cute and taste good unlike other we have purchase in the past. Nice packaging with the adorable panda. Barely any broken on arrival. Delicious fortune cookies and well packaged for a great treat. Perfect for a fun treat on our themed dinner nights with our friends each week. You can never go wrong with buying these in bulk and having it as a snack and not have to go to an Asian restaurant to satisfy cravings. Such a great price for 350 pcs of fortune cookies. Each of them is of course individually wrapped. Taste is perfect and messages are fun! I'm glad these Panda Fortune Cookies - 350/Case #1133900100 came with vanilla flavor, some fortune cookie varieties don't so i was hoping and I'm glad it does! We ordered these for our son's graduation party. They were a hit the kids and adults loved them. Great taste if your looking for a fun yummy snack or a party favor look no further. 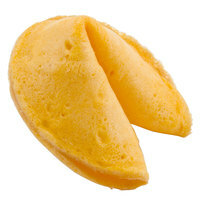 A great quality fortune cookie that are individually wrapped making them easy to distribute to guests. They taste great and keep for a long time. These are great fortune cookies. They'll stay fresh for a long time as they are individually wrapped. Good flavor. Subtle, but it's there with an assortment of fortunes. Great tasting cookie, and a good variety of fortunes included in the case. The shelf life seems to be pretty long, too. Great product at an exceptional price. I love these fortune cookies! Thin and crispy with an awesome flavor. They have a subtle sweetness and almond flavor. A great way to end a meal. A wonderful price for so many great tasting fortune cookies. The cookies are very flavorful and guests love getting these at the end of their meal. We offer some asian inspired dishes on our menu and give these to customers with their check. These are your standard fortune cookies, no complaints. These have a great flavor. Also, loads of cookies for a fantastic price! Most of the cookies arrived in very good condition with little breakage. The Panda Fortune Cookies are a really good deal. Perfect addition to my daughter's lunchbox. They are the same quality as we get from our local Chinese restaurant. I highly recommend these fortune cookies. Great messages in the cookies. The cookies tasted good, the were light. A few empty packages were in the box. Overall wonderful product. Thank you. These cookies are so much fun! The price is amazing for the amount you receive and they are sweet with a nice bite of crunch. Well packaged, minimal breakage on product. Crisp cookies. great flavor. We did use these for dipping in chocolate fountain. Held the chocolate very well. maintained shape and texture well. I bought this. This was one of the best fortune cookies I have ever bought there was a few minor setbacks like hell there was lots of cookies that were cracked but that does not really matter because you're still eating it and still going to the same place. I would highly recommend this for someone that has a business and wants their customers to walk out happy. My customers really loved it. Some pack is empty, but amount is correct. Except cracked cookies , still have more than 300. I am sure to buy again. Best price on the web for fortune cookies and they are actually pretty good. However, about 20 to 25 cookies come without a fortune, broken, or two cookies in one. But for the price, I can overlook it! Exactly what I expected! Very satisfied with purchase. These are for a big event and I could resist opening, eating, and sharing as soon as the box came. Very few broken. Packaged great!!! These cookies were delicious. The only reason for the 4 not 5 stars is that some of them were broken and some were missing fortunes. Nice fortune cookies, and so much fun. I left a bowl of them out for my clients at my office, and they went over really well. Had so many that I shared with family members, and even handed them out for Halloween. It's a great bargain. Omg!!! This is very great deal. I been looking many sites and stores But nothing can compare . Will order more. And it's taste yummy. The Panda Fortune Cookies come in a case of 300. They are very fresh and good tasting. I bought them for home use when I'm cooking for my family and friends. I love these cookies! These cookies have a great flavor and I will continue to purchase them because my customers remain happy with their purchases of this product. They've made their way into Asian culture and as a tradition these wonderful treats taste great any time and as a snack, dessert, or treat. Eating them becomes the treat. These are so much fun, along with the chop sticks and now the fortune cookies. It really makes our Oriental meals feel kinda "Special." I wait till everyone is finished eating then I add them to the table on my little "Thank You" tray. It's just fun. They arrived in great shape and are just so much fun.... Thanks for carrying them!